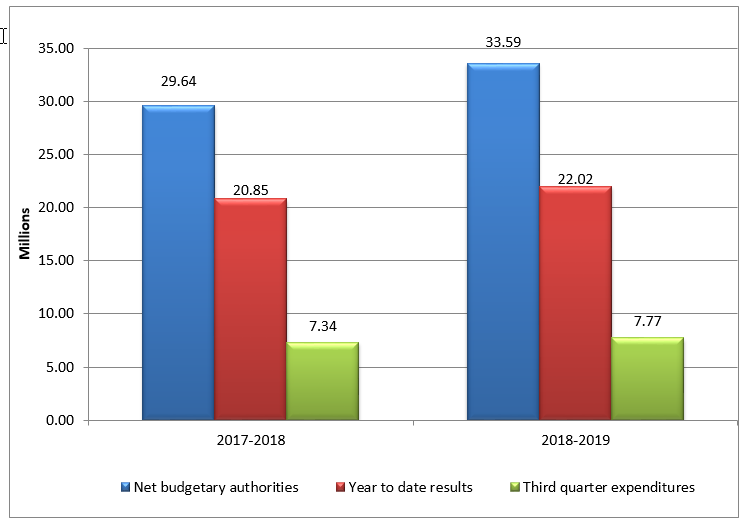 The figure illustrates the Agency's net budgetary authorities and expenditures for the quarter ending December 31, for fiscal years 2017-2018 and 2018-2019 where budgetary authorities and expenditures, in millions of dollars, is shown on the vertical axis and time period, in fiscal years, is shown on the horizontal axis. The CTA’s total authorities available for use in 2018-2019, totalling $33,589,285, have increased by $3,948,851 when compared to the same period in the previous fiscal year as illustrated in the Statement of Authorities and in the Departmental Budgetary Expenditures by Standard Object below. This increase is primarily attributable to the new funding received to support the CTA's modernization initiative, as announced in Budget 2018 ($2,414,177) and to implement legislative and regulatory changes related to Canada's freight rail system, as announced in the 2017 Fall Economic Statement ($1,937,411). This increase is partially offset by a negative adjustment ($125,791) to reflect the revised Employee Benefit Plans (EBP) rate and a reduction in the operating budget carry forward ($222,186). The expenditures in the Personnel category have increase by $152,985 and is primarily due to the additional resources required to address the influx of air travel complaints. The expenditures in the Acquisition of Machinery and Equipment category have increased by $73,057 and is primarily due to the purchase of informatics equipment, such as servers, in order to replace outdated equipment and support the CTA's increasing workload and personnel. The expenditures in the Transportation and communications, Information and Professional and special services categories have increased by $53,646, $69,035 and $87,097, respectively, over the previous year. Following the coming into force of the Transportation Modernization Act on May 23, 2018, the CTA consulted broadly with the travelling public, the airline industry, consumer rights groups, and other interested parties to develop new air passenger protection regulations, which resulted in an increase of these expenditures. Although these consultations ended on August 28, 2018, several expenditures were settled during the third quarter. There have been no significant changes in the nature of the CTA's operations or programs over the last quarter.